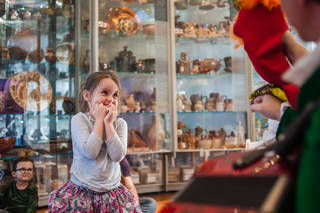 On 6, 13, 20 & 27 April, grab a hat and join Clara Button and her brother Ollie on a magical journey around the museum. On 4, 11 & 18 May take part in the Monkey and the Crab to mark Japanese Children’s Day. On 25 May, 1, 8 & 15 June meet either Queen Victoria, Prince Albert or Jim the dog and discover secrets and surprises of the museum. Celebrate Refugee Week, on 22 June, with enchanting stories and explore the theme of Food with music and storytelling on 29 June. Download the Spring 2019 Pop-up Performance Programme for further details. Performance times 11.00, 13.00 and 15.00 duration approximately 30 minutes.